OH MY GOD THERE’S A NEW IMAC AVAILABLE AND IT LOOKS SO COOL AND IT’S SO TINY AND I HAVE TO HAVE ONE AND AAAAAAAAAAAAAAAAAAAAHHHHHH!!!!!! And folks, I haven’t even had my coffee yet. Funny post on LJ statistics. I finally managed to get something up at Tvini.com so go me! Also, the new booties are coming along. 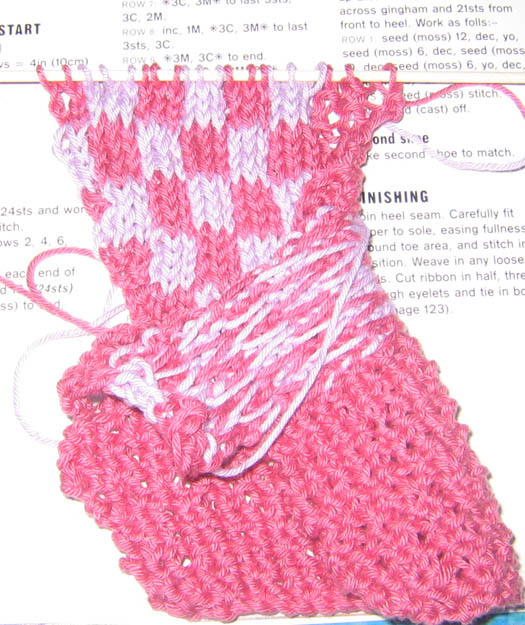 This is the first time I’ve done “short rows” which basically means that in the middle of a row, you knit X number of stitches and turn around and knit X number of stitches again, rather than knitting all the stitches on your needle. Trust me, it’s way cool. It makes it all 3D. Otherwise, I’d have to knit it all flat and then sew it up. This way will be much neater. Time to pick up the girl from school! My baby, my baby! You know what? 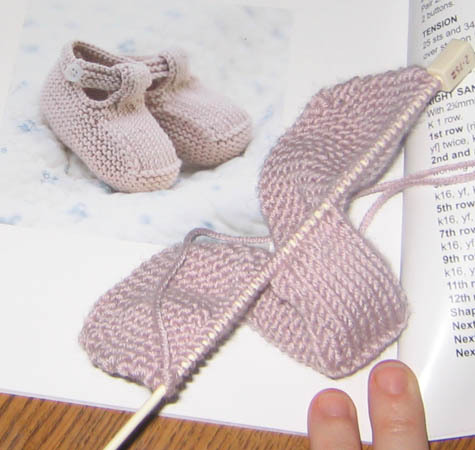 I’m just not happy with the way the booties are turning out. I did a suspended bind-off for a nice loose edge to the foothole, but apparently that was too fancy for the pattern and now it’s *too* loose. There’s a row in the bottom of the sole that was done wrong, and while I don’t think anybody else would notice it, I’ll know. Then there’s the matter of those puckers. Knitting’s supposed to be fun, and if I’m looking around, thinking “Hmm… what else can I make?” instead of picking this back up, then I shouldn’t be doing it. 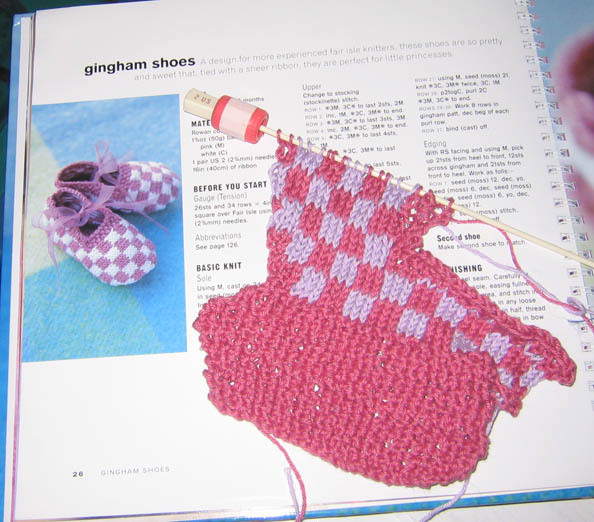 I think I’m going to put this bootie aside and try another design. I should say that Ceosanna and Tessima picked these out for someone else. Ceosanna and Tessima are not preggers. That I know of. These are for a mutual DR friend. 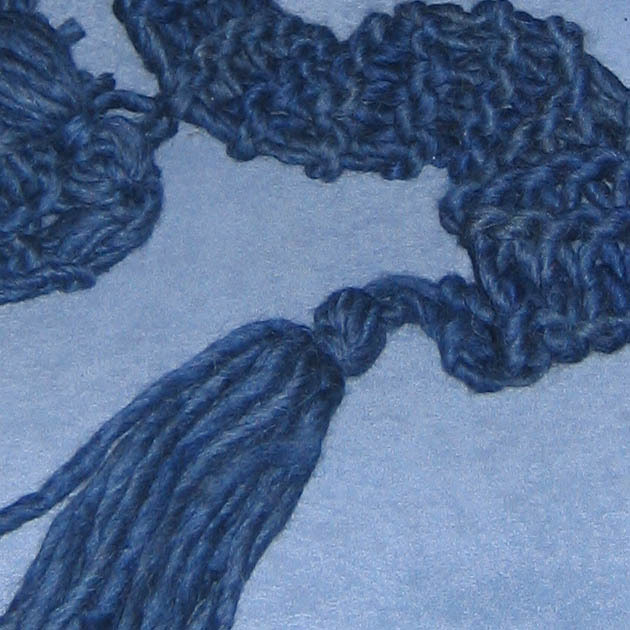 Next, an insanely long, super-chunky scarf that I knitted from some Blue Sky Bulky that I got in Alexandria during the Ceosanna/Tessima trip. The scarf measures between nine and ten feet long including fringe, and it hangs to my ankles. It took about a skein and a half, and I tried something new. I felted together the ends of the yarn rather than trying to weave them in or (God forbid) knot it, since I knew it would show up in a weave this loose. It worked well! I like to try something new in every project, and it’s always nice when it’s a success. I love this yarn. It’s 50% merino wool, 50% alpaca. It’s so thick it’s spongy. The color is very rich, the material is lush, and it was a fast knit. I totally want to make more of these. In DR news, I hope to get the hubby to show me how to upload docs to http://www.tvini.org tonight. I want to put the blank wedding worksheets up there, as clients sometimes lose them and get embarrassed to write for another. Don’t be embarrassed, people, I’ve heard it all! Unfortunately, the html editor I was trying out has expired, so I have to go hunting for a new one. BBEdit Lite isn’t available for free anymore. Anybody know a good cheap html editor for the Mac? Deer live in the woods behind my house. Life is good. My favorite RPG of all time, Paranoia, is back, baby, back! Wooooo! Of course, I have absolutely no time to invest in it, even though I really want to, but I’m just thrilled as can be that it’s out there! Everything’s ready to go into Ceosanna’s care package, which will now do double duty as a “thank you for putting up with us” gift and a birthday gift. I’m very excited! I love sending things to folks, and she’s got a couple of surprises coming to her that I know she’s not expecting. I only wish I had my digital camera so that I could post pics of them – after she gets the package, of course, so as not to ruin the surprise. (I’ll shut up now, as it’s not nice to tease Ceosanna.) However, the digital camera is with the hubby, who is camping on the Outer Banks this weekend. Here’s hoping he douses himself in bug repellent. And, because everybody else is doing it, I reckon I will too. This cool quiz by joneccleston – Taken 63733 Times. Yeah, material possessions may make me a total a-hole, but I STILL WANT A NEW SWIFT!